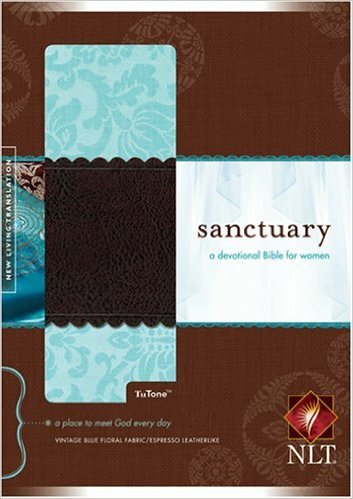 Sanctuary is often a beautiful daily devotional Bible for females with devotions by contributors for example Anne Graham Lotz, Elisabeth Elliot, Jill Briscoe, Rebecca St. James, and Teresa of Avila. It includes daily and weekend devotions on topics like prayer, worship, hymns, women inside Bible, and even more. Book introductions and highlighted verses concentrate on the theme of Sanctuary and intimacy with God. Attractive design elements include two-color interiors, ribbon marker, and gilded edges. This entry was posted in Religion & Spirituality and tagged New Living Translation, Sanctuary: A Devotional Bible for Women.